It struck me last weekend that, amid all the frantic garden visiting, I’ve written very little about what’s been going on in our town and seaside gardens. This is for two very good reasons. 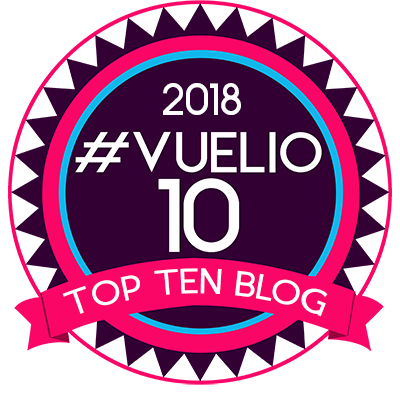 Firstly, both plots have been going through major upheavals (it’s all proportionate in a tiny garden) and have been looking nothing like their best. Secondly, the weather has been so up and down that my green-leaved friends have been making very little progress. I reckon the garden is still a good month behind last year, although many plants, like Rosa banksiae ‘Lutea’, have flowered for much longer in the cooler temperatures. 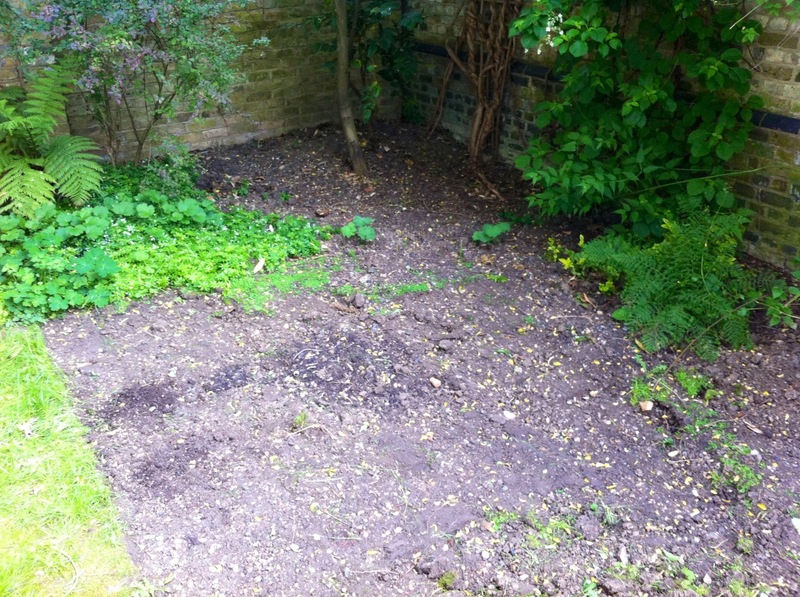 In London, the task I’ve been delaying for weeks – digging up the lawn – is under way. It’s not a fun job. The soil is either too wet or too dry, and beneath the bald sward I am discovering yet more impenetrable subsoil. Quite how I am going to make the ground habitable for the menagerie of fine plants I’ve collected during the spring I don’t know. What I do know is that cutting corners will not do, and so it’s out with the pick-axe and in with a decent layer of new topsoil and compost. 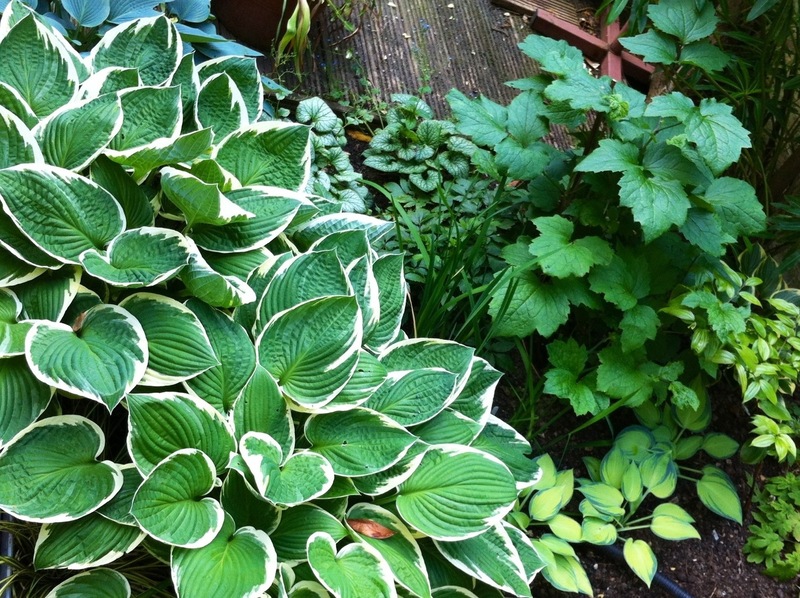 When the job is done it will be hosta heaven. In the picture below some of our old stalwarts overshadow three newly planted H. ‘June’ by the pond. By the seaside it’s been a different story. Our original wooden planters, which after 6 years had almost rotted away, have been replaced by fancy, bespoke teak numbers. 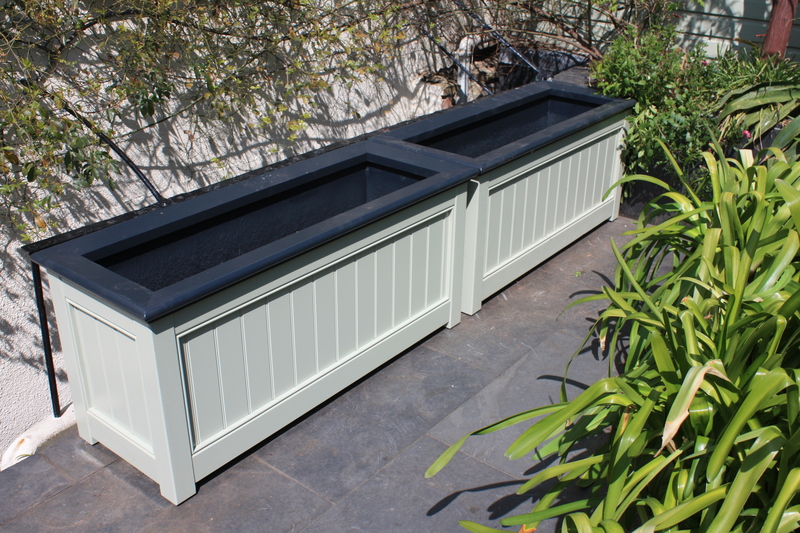 These came complete with fibreglass liners and were painted to match the rest of the woodwork. They were a fantastic gift from my lovely friends to mark my 40th birthday and the handiwork of the very diligent and friendly people at The Garden Trellis Company, across the Thames Estuary in Clacton-on-Sea. Thank you to all involved – including Him Indoors who did the measuring up – for the best birthday present ever. They are now full of agapanthus again, but that’s a story for another day. At the same time we’ve had the outdoor kitchen completely refurbished, as it had started to go the same way as the planters. The coastal sun and salty air was not kind to the softwood frame or the paint finish, so the only option was to do it properly, which we should have done the first time around. The kitchen now boasts a smarter worktop than we have indoors and watertight cupboards. 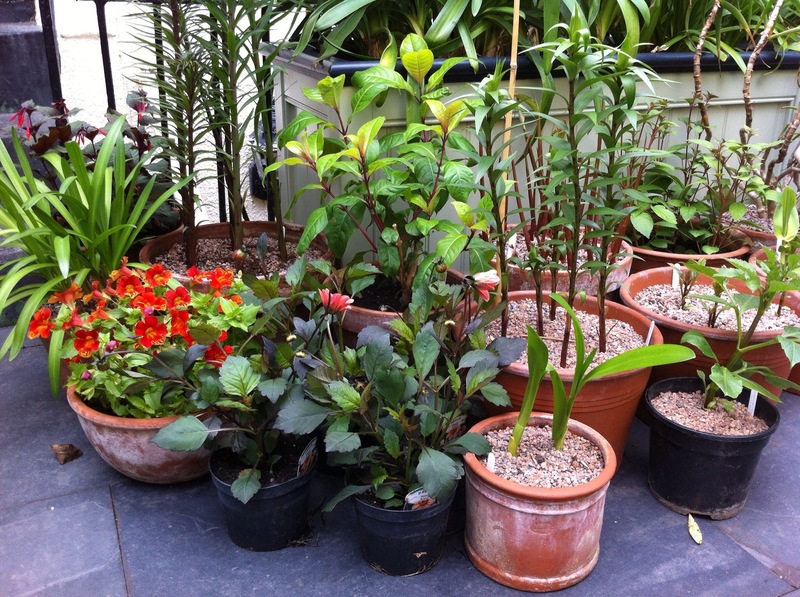 The end of the project coincides with the very last of the spring bulbs fading away, so I’ve been able to freshen up all our containers at once, ready for summer, which might eventually arrive. 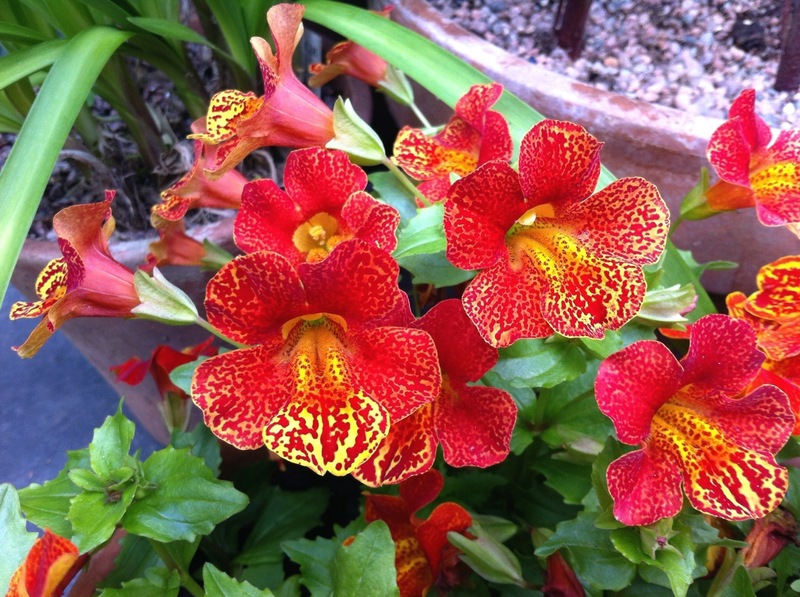 This year it’s going to be hot, hot, hot – colourwise that is, thanks to Lilium ‘African Queen’, Mimulus x hybridus (the monkey flower), Fuchsia ‘Coralle’ and Dahlia ‘Kiss’ to name but a few of my bright young hopefuls. Here they are, like the cast of new production, ready to explode onto the stage when the curtain finally goes up on summer. Let’s hope the show’s not a big flop and they’re not out of work by September! 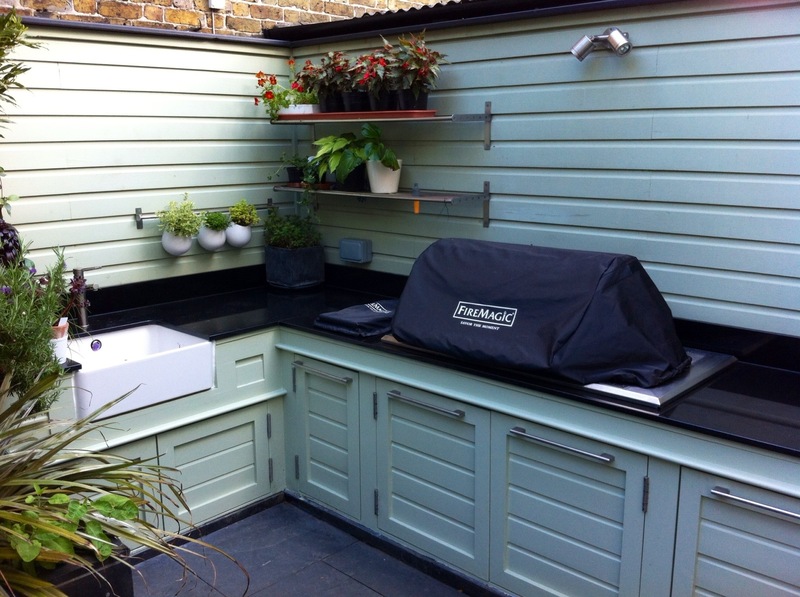 Absolutely beautiful…am loving that outdoor kitchen. Thanks Helen. We can actually use it this weekend as the weather is lovely.